With the news of a new Pope in Rome, I decided to review my photos of St Peter's Basilica and St Peter's Square from our trip to Rome last February. I was originally going to repost one I've posted before, but I took a look at the photos I have marked for future editing and decided to tackle this one. Another reason for using this image is to talk about travel photography advice. As the title says, don't just take the postcard photo when you're taking pictures while traveling. Don't get me wrong, you should take a traditional shot; the one you've seen a hundred times in travel magazines or on the web, but don't ONLY take that kind of photo. The ones you'll enjoy more are the ones you invest some time in by trying different angles, get closeup or many other options. The traditional take on St Peter's Square is the wide angle view with the Basilica, the Square, the Obelisk and everything in the photo. I did take that photo, but I wasn't very happy with it for a number of reasons. There were a lot of people mulling around, there was a lot of portable chairs setup in the square, and a LOT of construction with scaffolding everywhere. 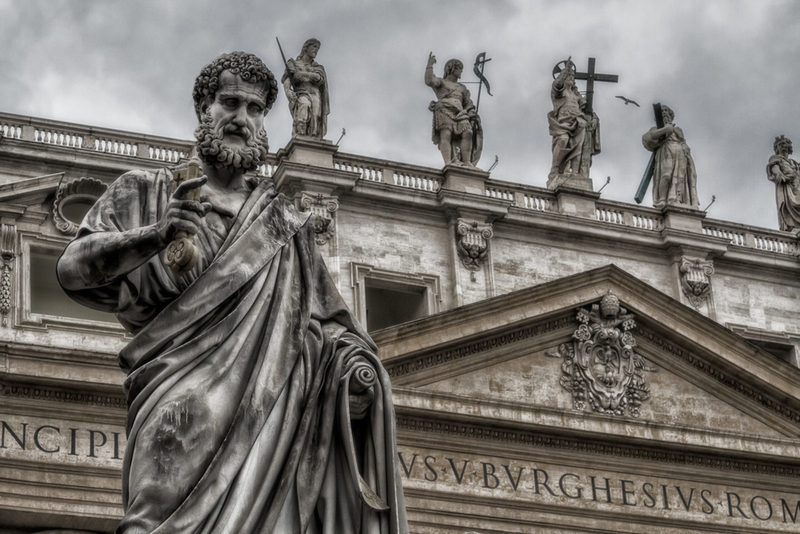 So I decided to try something different and focused on this statue of St Peter. I processed it with a technique I'm experimenting with that I call my "Not Quite" style. It's not quite color and not quite black and white. May be one day I'll go into more detail as to what it entails.